We've owned an Xtracycle Freeradical since 2003. Attached to a fairly basic mountain bike, it's done a lot of work in the past. However, for the last two years, our Xtracycle had fallen out of use. We both had become used to the comfort of Dutch town bikes, and as a result, we were more likely to pile parcels high on our town bikes, sometimes pulling a trailer as well, than to ride the Xtracycle. When I rode it in December, I noticed that the chain was worn and several things felt a little unpleasant, so work needed to be done. And then there's the "hybrid," an attempt to evolve a light roadster from the mountain bike, instead of just making light roadsters again. Mine evolved in sort of a big bang when I upgraded to a Big Dummy (reselling the FreeRadical to a deserving soul). It's my main bike, and now (like yours) upright handlebars, with fenders, big near-slick tires, and a dynamo (hub, not sidewall) running very bright homemade lights. I also went whole hog, and added a chaincase, and internally geared hub. It's nice. The biggest problem with mountain bikes is the high stepover; that's mitigated a little bit with the Big Dummy, but only a little. 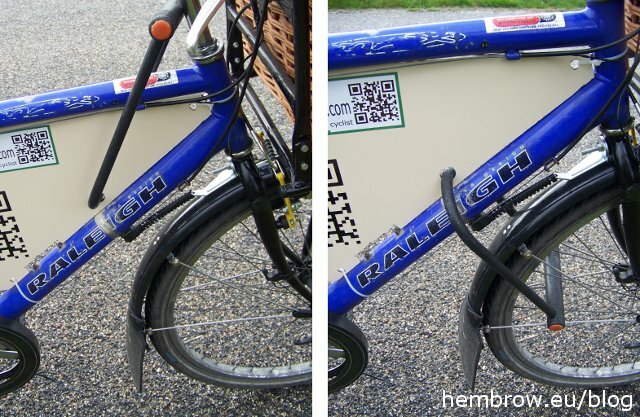 More power to you to make your cargo bike more comfy. I do have one concern: you changed out your triple chain ring for a single to gain more speed. Given that you're hauling way more weight, have your knees protested yet? For myself, I would have downgraded the triple to a double, and keep some of the low gears (especially for winter and especially for if the knees protest about the load). I've read your blog for a long time now, and I've seen your picture. This much is certain: you're not in your 20's anymore, and neither are your knees. Thanks for this! I've got hold of an old mountain bike (no suspension, steel frame) and have been wondering about the possibility of transforming it into something much more practical and comfortable for shorter trips. Nice modifications to your bike. I am considering my options for refitting my chain rings and bars. I think I'll keep my triple set though since I occasionally do some bush riding and recently found the smallest ring came in handy when carrying a load on uneven ground. I have already replaced the knobby tires and installed mud guards which have both been great improvements. It's the Dutch bars that have me most interested though. They could be what I'm looking for. They seem to have the right angles but not so wide as the cruiser bars I've been looking at. I think that most people who have "urbanized" their mountain bike don't realize how high their bottom bracket is. Regarding your advertising board and smart phones, how much of your sales is local? The only catch I can see with the Dutch handlebars, is the limited width. It shortens the arm, giving you a smaller moment along the fork axis. This can spell trouble when you're hauling heavy loads on the front rack. I used to do deliveries on a cargobike with one of those big rectangular baskets with a canvas top. You could cram a lot of goods in there, but keeping the fully loaded bike on the straight and narrow was really a man's job: substantial upper body strenght required. So pack the front end lightly. I had an xtracycle with low BB (you can do that, depending on how you join the rear end, and the donor frame). The longer bike is a bit more prone to pedal strikes and bottoming out. Do note, the US has little bicycle-sensitive infrastructure -- hopping curbs is part of the daily ride, so a mountain bike is not necessarily the worst choice, given that. I've got very skinny handlebars (42cm). I don't carry a lot on front, but big loads that extend much past the rear axle (on a Big Dummy or Xtracycle) can set up some pretty amusing oscillations. You adjust (or at least, I adjust) within a few hundred yards, but my arms are mysteriously tired after 10 miles with a load like that (last time it happened it was some wood from a downed tree). This may just be a matter of use it or lose it. It is a mystery, why bikes in the US that carry nothing at all, have such wide handlebars. Biking makes my knees happy, and my friends with bad knees were usually told (post surgery) to incorporate biking into their physical therapy and/or recovery. kfg: The "hybrid" leaves me baffled too. They vary a lot, but most seem to be in effect mountain bikes with a few steps taken towards being practical machines. dr2chase: Sounds like you've a nice bike now. I used to make my own lights too. However, I haven't done so recently because you can't get the optics. I think this is the most important point - the cut off at the top. However, the light I've fitted on the Xtracycle is rather more primitive than all that. It's fitted because it's cheap and good enough. I've also had the oscillation problem in the past. Same cause, too. There was a tree blown down by the wind near my work in Cambridge and over a couple of days I took it home as firewood. Riding with an absolutely huge saw poking out of the back of the bike seemed to make motorists more aware of my existence. highwayman: Don't worry about my knees. The low gear is 42 inches (I'm still not used to the Dutch way of measuring gears) which is definitely a low gear to me. However, of course other people make other choices. If there was a hill between home and the post-office, I might have made a different choice myself. As it was, I only ever used the biggest ring on the triple on my bike, and often span out even with a load of stuff on the bike, so it made sense to just have one chainring slightly larger. townmouse: It's worth a go. You don't have to do everything at once, of course, and can do just the things you want to do. Everyone's different. David J: If you need the gears, you need the gears. I like the Dutch bars. I'd suggest also taking a short reach stem if you want to be able to sit more upright. MTB stems tend to be very long front to back. If you end up quite upright, then you also are more comfortable with a wider saddle like that which I fitted. Narrow saddles as fitted to many bikes as standard work best for a leaning forwards position. GIF: I think that's true. Also, a high bottom bracket has become an expectation as a result of MTBs. It's one of the less positive aspects of the MTB influence on modern bikes. And how many sales are local ? Just a few. J..: The change to the stem and handlebars also brought the luggage on the front closer, so I lose a bit side to side, but gain front to back. It's actually better to ride with a load on the front now than it was before. I usually put heavier parcels on the back and lighter in the front. However, even with quite a weight on the front it's not too bad. David: Putting the load close to the axis is actually more important, because of the forward angle of the fork axis. So yes, your handling should have improved. @David - My light recipe is two-part. First, the basic plan is to glue the LED (and symmetric optics) to a piece of aluminum angle. Then, glue a piece of acrylic mirror across the top, and let it stick out a few inches. There's your cut-off, and it also keeps the light out of your own eyes, which is a very good thing. I tinker the mount up and down till there's not too much light escaping upwards. Second, is I add a second pair of lights, same construction, AMBER, lower on the bike, and with a lower aim, and add a toggle switch to switch back and forth between them. Low beams. The additional cost is about $20. I do this because the high beams are also intended for visibility by car (and truck) drivers, so there has to be some light lost upwards, and that is inevitably rude to people not in cars. Amber is much nicer to your eyes. I would love it if the high-end lights were cheaper, but they are not, and it infuriates me, because I know that the LEDs are affordable, and the rest is just molded plastic. The other reason that I like DIY is that upgrades are relatively affordable; swapping in the next generation of LEDs (40% brighter!) costs only $20-$30. I'm also tinkering; I wanted a "real" standlight circuit, that would run the LEDs good and bright when I was stopped, so I built one, and it does. Capacitors, even ultracapacitors, aren't large enough to run 1-3 watts for a minute or two (60-360 joules, capacitor energy is 1/2 C V-squared), but that is easy for a battery. dr2chase: To some extent, I share your frustration with cost. I used to make my own lights too for much the same reasons. It was the cheapest way by far of getting good lights. However, I stopped a few years ago when I saw how the optics on the good lights were going. You can't buy a lens which does the same job because the good lamps don't use a lens but a mirror which gives a very different effect. No direct light shines into the eyes of people coming towards you so you don't need a second option to avoid dazzling. The B&M IQ Speed was what made me forget about trying to make DIY lights. I had already bought high power LEDs and optics to go with them, but putting these together produced something which by no stretch of the imagination was ever going to let me ride so confidently at 40 km/h into darkness and see where I was going, without worrying about blinding people. I still use my IQ Speed. It's still a great bike light, but it's no longer the leading product. The two new lamps from Philips take some beating. There's a version for dynamo and another for battery usage. They also don't just have a cut off at the top, but in this case, two LEDs pointing downwards against a shaped mirror which produces a really nice light pattern with graduated optics which not only cut off at the top but also reduce the waste at the bottom while giving the brightest part of the beam at the furthest distance. You get an awesome "reach" with these lights. They also allow light to spread more evenly sideways than the B&M lights. You're plenty visible without dazzling anyone, and without needing another lamp to switch to in order to be visible. But it's not just that. They're also a really nice quality product with rather lovely cast aluminium bodies and coming with all the fittings needed to mount them on a bike quickly. They're a quality product that just works, and at the end of the day you have something which comes with a guarantee, legal approval as a bike light, a standlight which works for four minutes, and a better appearance than a piece of aluminium angle. What's more, frankly, €80 isn't really all that much for this performance and convenience. DIY projects add up too. The cheap light that I fitted to the Xtracycle isn't in the same class, and the beam is a bit of an odd shape. However, it's a matter of "horses for courses". I have no intention of riding the Xtracycle at 40 km/h into darkness. It's generally used only in the town. This is still usefully bright (better than Halogen lamps were) for a mere €12.50 ready to go. It's not really possible to DIY anything useful for that price. It's a shame, really. I like the idea of building things myself, and I applaud you for continuing to do so. It's fun to do this stuff. I just don't think it's particularly worthwhile any more. As you'll have noted, I did DIY the rear light for my Xtracycle, but that was a reaction to conditions. There's no useful place on the Freeradical to put a rear light, so I made a bracket to go under the saddle and used an old LED battery rear light with nothing more than a suitably sized series resistor to stop it putting too much current through the LEDs. It works just fine. In the past I've also made standlights, but not this time. Riding in town here simply isn't that dangerous and a standlight isn't required by law.